Outrageous greed. 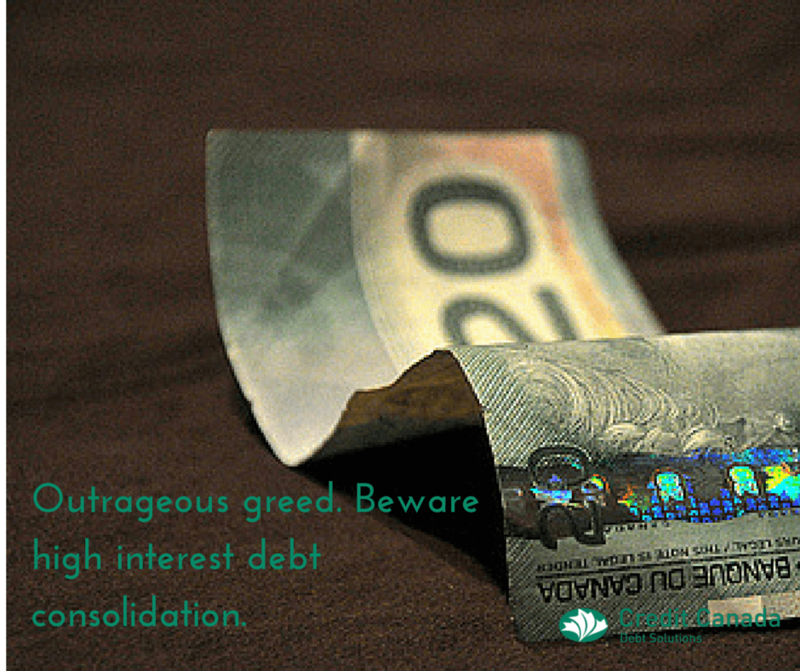 Beware of high interest debt consolidation. Just when you think you’ve put greed on the run in Canada, another kind of company surfaces with predatory financial practices. Let’s set aside how agencies like my own have lobbied the government to successfully reign in “debt settlement” and “payday loan” practices that bring grief to borrowers. Instead, let’s turn to another challenge facing fair-minded professionals within Canada’s debt services industry. It involves a new breed of lender providing what are called “instalment loans.” Many instalment loans appear to provide a quick solution to debt problems through debt consolidation that bring a customer’s debts together in one place. Problem is, these loans come with interest rates that are through the roof and into the stratosphere. For a loan, a grandmother faced what effectively amounted to an annual interest rate of more than 57 per cent – about three points shy of the criminal rate. Just how high do the interest rates go, and what kind of customer pays the price? Well, allow me to paint you a picture. Imagine a grandmother without a lot of money skills. She is supporting two children on a middling wage that has not increased in eight years. As the cost of living continues to rise, she struggles to keep up. The bills pile up, she goes into debt, and eventually she lapses in her payments and gets a poor credit rating. Her financial situation only worsens. She applies for a loan through a bank, but she is turned down. Out of panic, she approaches an instalment loan company that’s happy to lend her money, but at an astonishing price. She borrows $5,100 with payback terms of 36 months. Having failed to read the fine print of her contract – including provisions for both interest and “insurance” – she doesn’t realize she’ll end up repaying $13,400 over the three years, bringing to more than 57 per cent the effective annual interest rate on the loan. To put that interest rate into perspective, it’s just about three points shy of what Canada defines as a criminal rate of interest at 60 per cent, a worrisome fact in itself since the cap is so high. Loans and debt consolidation at these astronomical rates are in my view ridiculous. Desperate people pursue desperate measures. When poor financial planning skills are added to the mix, big trouble is bound to follow. Contact us if you feel you could have your debt lowered with a consolidation loan. The story of this hapless woman was told by CBC TV’s Marketplace recently, and CBC should be applauded for its investigative work. It brings to light financial practices that are simply not acceptable in a civilized society. Granted, the woman ought to have shown more caution when taking out the loan. But the truth is, financially desperate people are liable to pursue desperate measures without thinking things through. When poor financial planning skills are added to the mix, big trouble is bound to follow. More troubling is the fact that the grandmother is far from alone in a consumer culture where financial planning skills need improvement on a wide scale. How many people are in the scavengers’ grip? And what do we as Canadians plan to do about the situation? Widespread awareness is a good start. Turns out that while faced with a debt load she simply could not handle, the grandmother eventually caught wind of Credit Canada’s not-for-profit credit counselling services, including a debt management program that is a smart and fair alternative to high-interest consolidation loans. With us, the grandmother has consolidated her debt for a single monthly payment at an interest rate she can afford. We got between her and the instalment loan company to negotiate the new rate. In addition to helping her manage the debt, we’re teaching her about financial goal setting, monthly budgeting, and financial planning. I ask, though, how many more people are suffering with high interest loans that could be lowered through a debt consolidation loan? And what do we as Canadians plan to do about the situation? Widespread awareness about these lending practices is a good start.